The book Anatomy of Yoga: An Instructor’s Guide to Improving Your Poses illustrates many of the yoga poses that I incorporate in my classes. It will also be of interest yoga instructors who want a visual aid that clearly illustrates the benefits of each exercise. 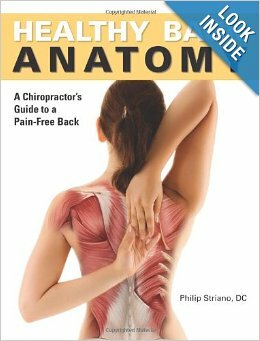 Written by a leading chiropractor, Healthy Back Anatomy features a range of exercises that help strengthen and stabilize the muscles of your back. Each move includes step-by-step instructions, plus full-color photos and anatomical illustrations that let you see how your muscles work. You’ll see what muscles you’re targeting and learn how to avoid injuring them. And, when you’re ready, you’ll even have modifications to make the moves harder and challenge yourself further. It’s a complete program that includes stretches, balance and posture exercises, and lower back, neck, shoulder, and core exercises, as well as warm-ups and cool-downs.